Do you write papers, books, articles, briefs, resumes, grants, translations, syllabi, or abstracts? Do you spend more than one sitting working on the same document? If so, then Draft Control is for you! 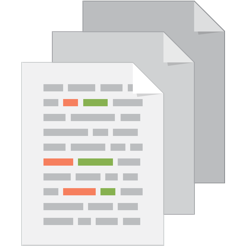 Draft Control works alongside your word processor to automatically store versions of your document and keep track of changes that you’ve made from one version to the next. It supports your writing as you move forward from draft to draft by automatically archiving each change and every version. 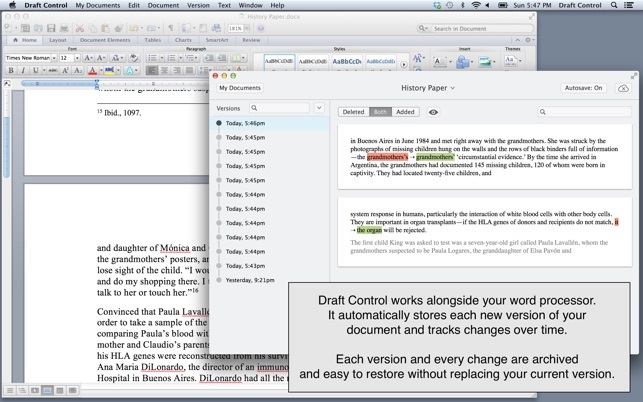 Draft Control fits into your writing workflow without interfering with your word processor. 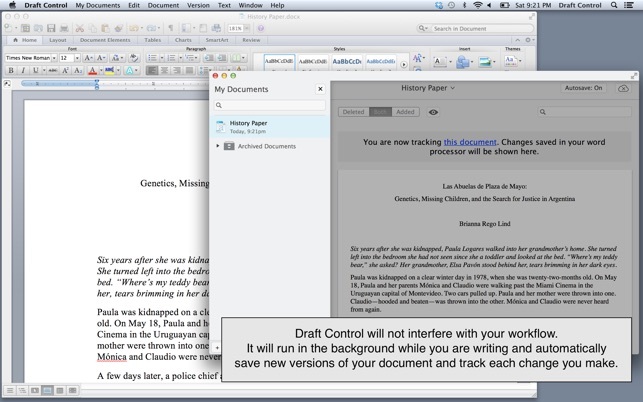 Draft Control runs in the background and automatically saves versions of your document. This way, Draft Control keeps track of versions and changes without cluttering up your document with Track Changes, notes, or edits. You will feel free to delete any chunk of text because Draft Control stores all versions, and makes it easy to search for previously deleted text. Stop saving duplicates of your documents! In Draft Control you can add a label to any version, allowing you to differentiate between versions. Worried about keeping an offsite backup? 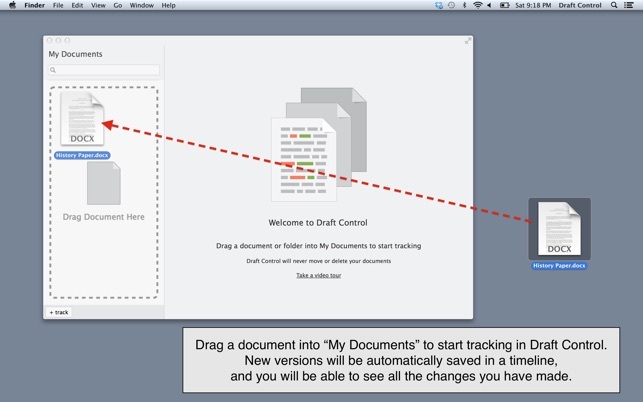 Draft Control can easily and securely back up all versions of your document to iCloud. Don't remember which version has the text you need? You can search through all versions for changed text. Once you find the version you're looking for, you can easily restore the desired text. Want to see a list of changes between versions? You can compare any two versions to see what changed, and produce a PDF of the displayed changes to print or send to a colleague. A collaborator made edits without using Track Changes? You can insert their version into your document's timeline to see exactly what was changed. Draft Control works on Mac OS X 10.8 and higher. Great - but why are we calling google analytics? This is a fantastic app. 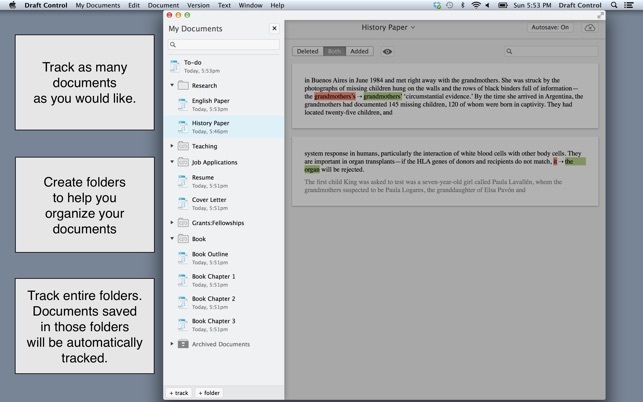 What I like about it is that 1) it works with Scrivener and 2) document changes are very easy to see and recover. I would like to buy this application but one thing really bothers me: why does Draft Control phone Google Analytics? This should not be necessary. I consider this an invasion of privacy - as is just about everything associated with Google. Can the developer please remove this behavior from the app? Update: May 22, 2014: Draft Control has been a bit crash recently. It used to crash if I added it to the list of login items. That still happens, but it now crashes at least once, sometimes several times whenever I open it. The app still tries to phone Google Analytics, btw. Draft control makes is easy to see all of my previous versions of long research papers. It prevents the inevitable confusion that happens with saving different versions of documents on different days. It’s simple, user-friendly, and has saved me the time and heartache I used to spend when I realized that I had been editing the wrong version of a paper, or that I’d lost really good language from previous drafts. Super helpful for writing! I downloaded Draft Control a year ago and use it primarily for business contracts, internal strategy documents, and papers. It's a fantastic addition for me - really easy to use, and a definite improvement over trying to store countless different versions. 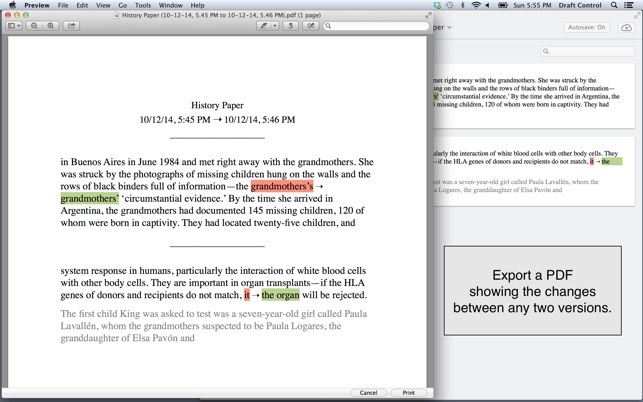 Also, it works great with Microsoft Word and has better versio tracking/comparison than google docs in my opinion. Kudos draft control team!